There's no denying that the iPhone is a great-looking smartphone, yet more often than not, it does end up inside a case – a case to protect it from the every-day wear and tear. Some people choose the practicality of a slim, snap-on case or cover, while others go for more solid, more durable and heavily armored solutions. There's nothing wrong with either choice, but there are many, many other options available. 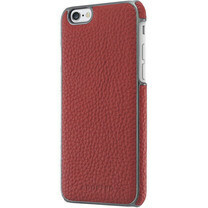 One of the alternatives is to outfit your iPhone with a leather case. Leather is well-known for its durability and timeless look. That's why a leather case is a suitable choice if you want your iPhone 6s to be well protected and to look great at the same time. So, if you're in the market for a leather iPhone 6s case, here are 10 of the best cases you can buy right now. This limited edition case has luxury written all over it. Made of genuine Italian leather, it is both durable and stylish. Variants with and without a flip cover for your iPhone's screen are being offered. This beautiful flip cover case blends two natural materials – wood and leather – to create one exquisite accessory. It is proudly hand-made in USA. This slim pouch made of natural leather features a pocket on the side, where an ID, a credit card, or a few banknotes can fit. The accessory is both beautiful and practical. At Adopted's online store you'll find a broad range of leather-made cases and folios for the iPhone 6s, including this model in a striking hue of red. Many other colors are available. Speaking of variety, Vaja has a plethora of luxurious leather cases of various designs. Many of them can be tailored to the customer's preferences. But they do cost a pretty penny. Otterbox are known for their tough, durable cases. This one isn't any different as it can withstand plenty of abuse. Three different styles of leather are available. Leather iPhone 6s cases of various colors and designs are available at Hex's virtual store. This particular model has a copper-like color finish and sports a pocket on its back for a couple of cards to fit in. Moshi has gone with vegan leather for its lineup of leather iPhone 6s cases. This particular model is available in 4 traditional colors - black, light brown, dark brown, and navy blue. This hand-made genuine leather case screams style out loud. Along with the accessory you get a matching coin pouch, also made of leather. And lastly, we present you Sena's slim leather pouch, available in a variety of pretty, stylish colors. For a few bucks extra, you may make this a truly personal accessory by having your initials imprinted on it. Oct 12, 2015, 9:51 AM, by Luis D.
Oct 18, 2015, 5:23 PM, by Nick T.
Oct 09, 2015, 9:06 AM, by Chris P.
Oct 02, 2015, 5:58 PM, by Peter K.
Sep 28, 2015, 9:20 AM, by Luis D.
Sep 16, 2015, 8:11 AM, by Daniel P.
Sep 11, 2015, 3:30 AM, by Chris P.
How on earth do you forget TwelveSouth? Sena and Pad & Quill are no-brainers for leather, but so is TwelveSouth.